I’m sure you will agree that the hobby is full of talented individuals, whether they are authors, sculptors, painters, model makers…the list goes on. I’m lucky enough to know many such people, and I am constantly amazed by the quality of the work I see. However, every so often you see something that is, quite simply, stunning. One such moment happened last Friday. Ade Deacon and Alan Sheward (who are both known for putting on fantastic looking games themselves) went to play a game of Sharp Practice 2 (the new Black Powder rules from Too Fat Lardies) at the home of Jim Ibbotson. 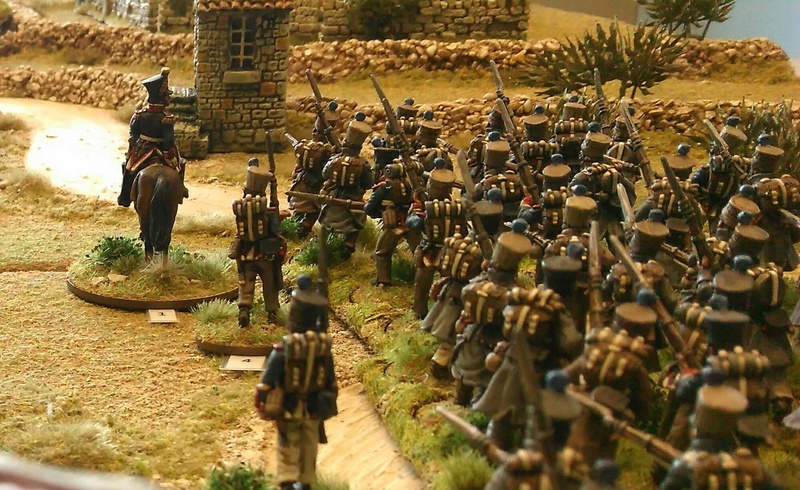 The encounter was a British vs French game from the Peninsular War, using Jim’s beautifully painted 28mm armies, fought over Alan’s equally beautiful terrain boards. Jim (Twitter name @LtHarryStocracy) tweeted pictures of the game during the day. Not only were Jim’s wonderful miniatures and terrain on show, but he showed that he was no slouch with the camera either as he took some fantastic photos. I exchanged messages with Jim, and was surprised to find that he currently doesn’t have a blog, so unless you follow Jim on Twitter, you may not have seen these. Jim has very kindly given me his permission to share his pictures on this blog. Remember, these were all taken during a game – they were not staged. The captions are the words that Jim used to accompany each photo on Twitter. They are truly inspirational. A detailed look at the desperate struggle for the hill. Many men fell here. Wow some great pictures. The miniatures are so well painted and the terrain looks good too. You have to look a second time to see that it isn’t a painting! What fantastic photos showing amazing figures and terrain. Having played a couple of Jim’s games at the Evesham event I know how talented Jim is and very modest as well. Awe inspiring!